When using JET Charts in APEX regions, I often enable the “Show Maximize Button” in the live template options of the regions. This allows users to view the region in a “full screen” display mode. However the JET chart height is NOT following and will stay the same height, unless we use a little CSS. The chart only takes up the same height as before – when it was constrained in the small region. So what my users want is that the height scales up to the full screen (as the width is doing). The region has gotten a “is-maximized” class when the user clicked the button. Also notice that below the “orders” region div, APEX creates another div containing the actual chart component. This div is always called <static ID>_jet. In my case this is “orders_jet”. We can use that information to construct the CSS needed to increase the height. This CSS snipped can be pasted into the “Inline CSS” property on the page which contains the JET Chart region. What the users wanted, the chart is maximized in both height and width. 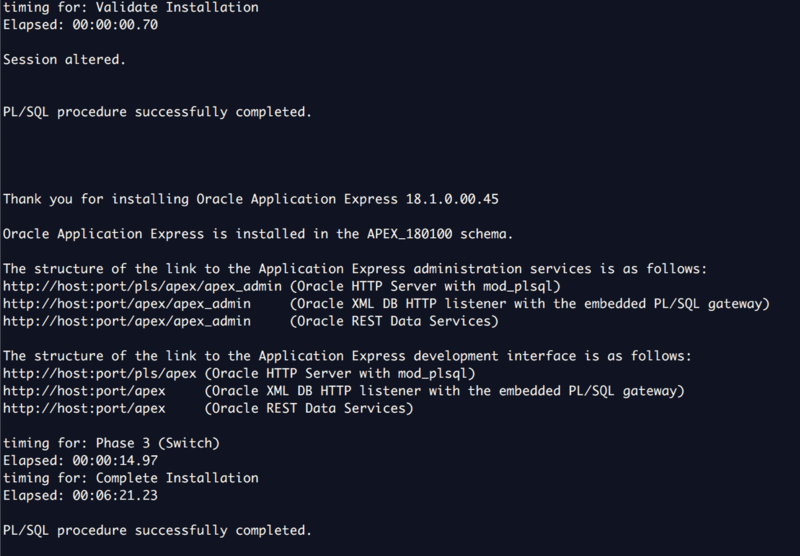 Yesterday the new version of Oracle Application Express (APEX) was released. Oracle is now naming their product with Year.Quarter, so the new release is 18.1. The upgrade procedure is basically the same as when you perform a new installation. In my case, APEX is running on a cloud server hosted by “upcloud”, running the Oracle XE 11g database and the winning combination of Apache Tomcat and Apache HTTP Server as the application/web tier. Most cloud providers has a backup button somewhere. So use this before performing the upgrade. Time: 5 seconds. I used “scp” to copy the product (zip file) to the server. Time: 8 seconds. As the “oracle” Linux user, start sqlplus and perform the installation. Time: 21 minutes. Images from the APEX zip file extract must be copied the web server images directory (in my case the Apache directory behind the “/i” alias. Time: 15 seconds. 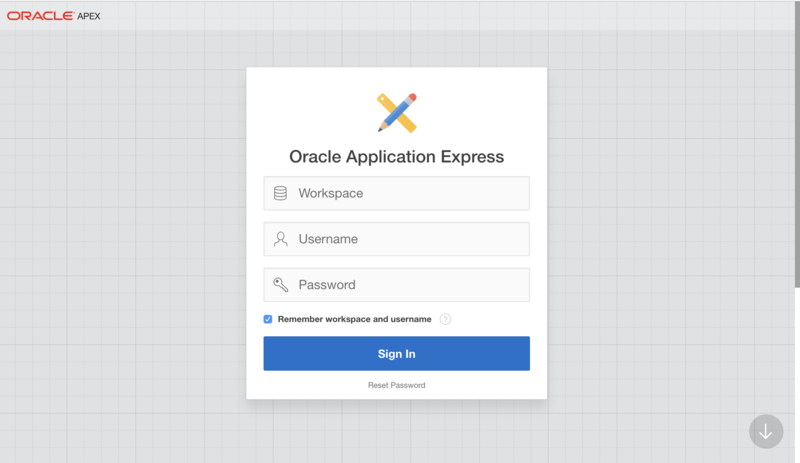 Thank you to the Oracle Application Express team. 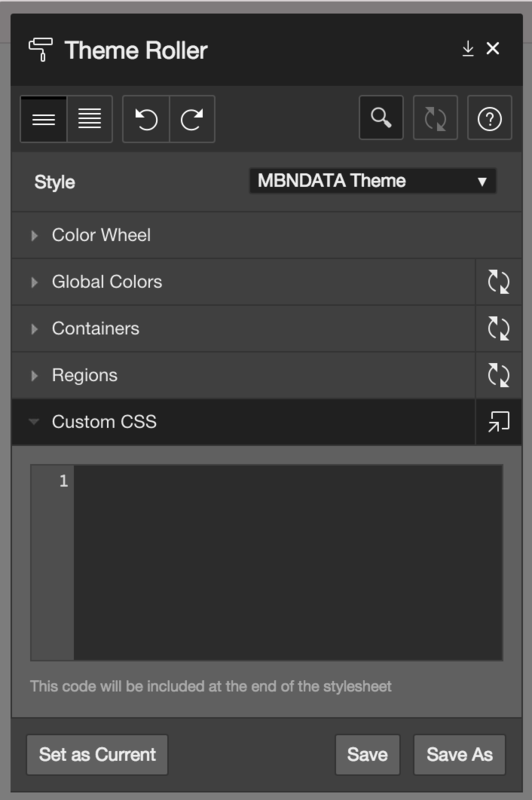 I can now create even more awesome applications, better integrated and faster than ever. 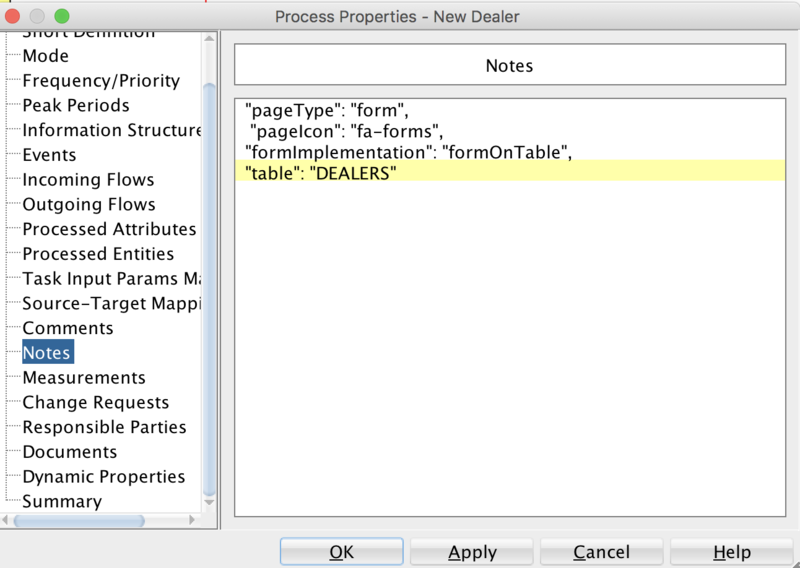 I have been looking for a way to specify which data is actually used by a process in the SQL Developer datamodeller. Now its time to document it (so I dont forget). At last you can choose entities and attributes that should be linked to the process (use the + sign). 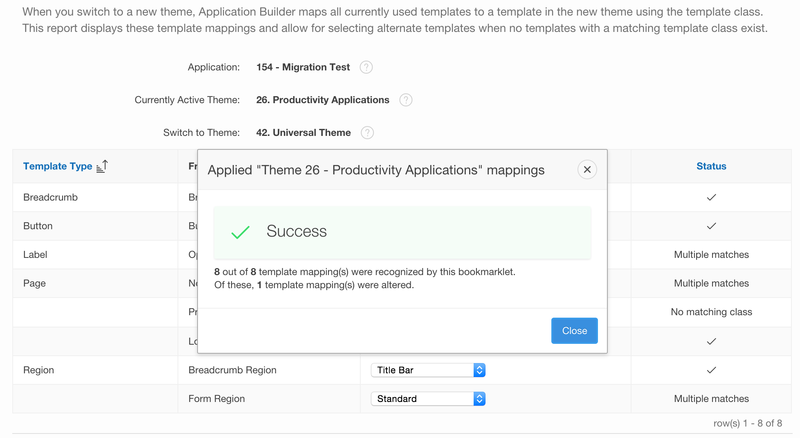 Since the introduction of the new APEX “Blueprint” feature (currently only available on apex.oracle.com), we can create APEX applications using a “blueprint”. The blueprint can be supplied in JSON format which opens up a number of great possibilities. As far as I know, the Blueprint feature will be available (outside apex.oracle.com) in the upcoming 5.2 version. So, now that we can auto-generate our APEX applications from JSON, all we need is to convert the processes from our design phase into JSON. The are many variations of these JSON properties in the new Blueprint format. The best way (for now) is to try out difference page types using the APEX Blueprint creation page, and then check out the JSON that is generated from this. (Remember to grant SELECT on the DMRS tables you want to query from your application schema). The application will generate Blueprint JSON for the model design of your choice using this PL/SQL package (procedure generate_blueprint_json). Basically this PL/SQL procedure is traversing the processes from the reporting schema and generating JSON (using APEX_JSON), mimicking the JSON which is generated by the APEX Blueprint generator (apex.oracle.com -> Application Builder -> Create -> Blueprint). 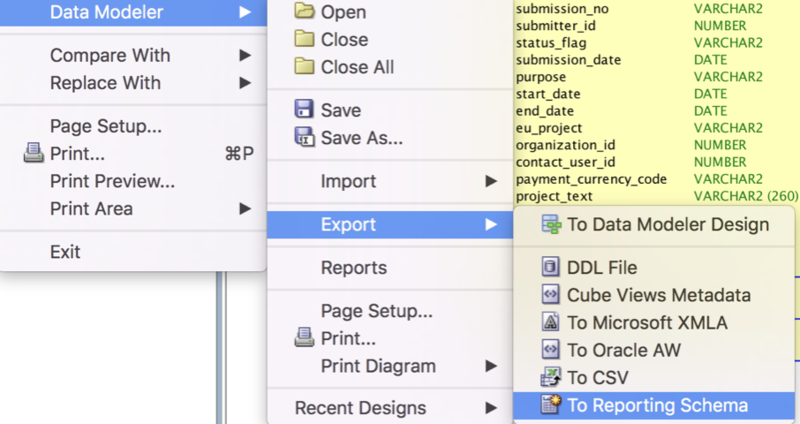 APEX Pages (Editable grids, Interactive reports, Forms, Calendars), already pre populated with the table and other options you have entered into the process description (JSON annotations). It will actually be enough if the application is a simple table maintaining application :-). I wonder if the future will bring even more SQLDeveloper Modeller / APEX integration. One can only hope. I really like the new chart types which adds a lot of control to developers and also gives the end-users some eye candy (see the movie). Oracle JET Charts will (as far as I can read) be available in APEX 5.1. I am looking forward to this, because these charts seems to have a lot of potential. Will post more when I progress further with this plugin. 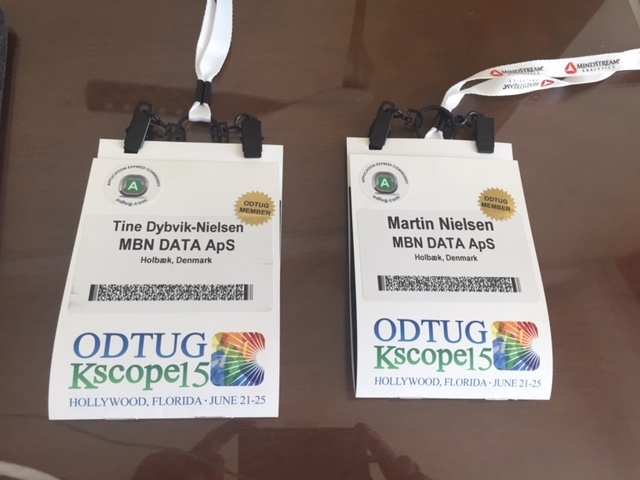 Safely returned to Denmark after a great ODTUG Kscope 15 experience with lots of fantastically talented APEX entusiasts from around the world. We (my college Tine and myself) basically attended all the APEX sessions we could during the conference. I will try to sum up the essence of what we leaned in a number of blogs which will be published over the next week or two. What does any business application deal with? DATA! That is the core. That is what drives the business. Applications come and go. Data is forever. Where does the data live? In the database. The database is the core. The database has been that since the 80’s. Is still that. Focus on the core. Design for the core. Leverage the core. Having established that, where and what and how is the best way to deal with the data? INSIDE the database. Not in Java Beans. Not outside the database where you have to re-invent the wheel ito concurrency controls and caching and all that. What the hell for!? Can a bunch of Java Beans provide better caching and concurrency than Oracle? Of course not! 1) You will be called a dinosaur for such archaic thinking. It is great that there is a movement for spreading this important message so we can have more APEX applications in the world :-). Shakeeb Rahman from the Oracle APEX development team walked through the new universal theme (42), and talked about the conversion from existing themes, and how to use the Theme Roller. Note the selection of “Reset Grid” and “Match template classes”. The match is set to “No” because this will be done by the bookmarklet.